Bratislava, Slovakia – They call it the ‘Little Big City’ with its ideal geographic location that give Bratislava the fullness of its character offering more than you would expect. In past couple of years Slovakia has welcomed a lot of new international brand hotels, e.g. Holiday Inn, Hilton, Kempinski, Sheraton, Mercure (by Accor), Chopin (by Vienna International), Austria Trend Hotel, Crowne Plaza and also some international alliances e.g. Small Luxury Hotels, Small Leading Hotels of the World, Preferred Hotels Group, Best Western Hotels etc. It is still relatively an undiscovered destinations. Bratislava Airport, named after General Milan Rastislav Stefanik, is a 15 minutes drive to the west from the city center – however, the Vienna Airport in Schwechat is only 40 minutes drive westwards from Bratislava city center. Our Vienna & Slovakia DMC member can assist with all your meeting and incentive requirements. Straddling the Danube with the Old Town to the North and the New Town to the South, Bratislava is the capital of Slovakia and the crossroads of Austro-Hungarian history. The city borders both Hungary and Austria and the influence of these countries can be found in the Baroque architecture, the spicy food and the spirited culture of the Slovak people. Although Bratislava is less than half a million inhabitants, it is one of the most glamorous and relaxed city in Europe because of its old-town charm, sophisticated restaurants, traditional pubs, good music ranging from jazz to opera and stylish people. Also, many hotels of 4 and 5 stars have opened their doors in this beautiful city. Luxurious hotels are in the city centre, many of which are right in the old town pedestrian zone. Kempinski Hotel River Park is a newly built five-star hotel in the River Park Business Center. The hotel offers 231 sizable rooms and suites . What makes it a Unique Hotel is its rooftop Zion Spa and Fitness Center overlooking the river. 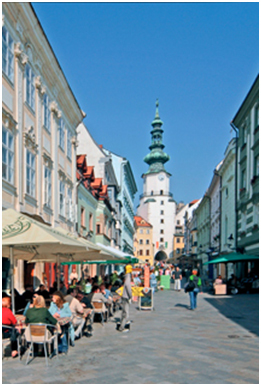 Sheraton Bratislava is ideally located in the heart of the city, the historic centre is about ten minutes walking. Adjacent to the Sheraton Bratislava is the Eurovea Gallery with numerous shops, bars and restaurant. Just opposite the Sheraton Bratislava Hotel is the new Slovak National Theater. 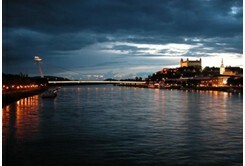 Bratislava is a well-known wine trader. Their historical wine culture has made them become experts. Some local winemakers are offering wine routes including tastings and also castles visits in the area. Contact us and we will be happy to put you in touch with our Central Europe DMC.